Here are a few things you can do at the Great New York State Fair. For as long as I can remember people would line up to get 25 cent chocolate or white milk at the Rainbow Milk Bar in the Dairy Building each and every day. Best deal at the Fair. 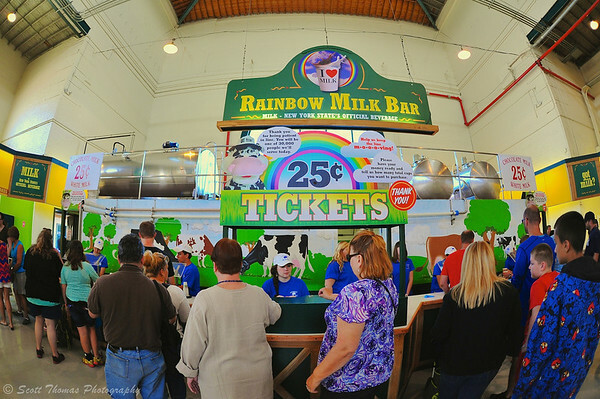 People waiting to get 25 cent cups of milk at the Rainbow Bar in the Dairy Building of the Great New York State Fair in Syracuse, New York. Nikon D700/Sigma 15mm, 1/125s, f/2.8, ISO 720, EV 0. The New York Animal Agriculture Coalition and Cornell University’s College of Veterinary Medicine is sponsoring the Dairy Cow Live Birthing Center for the first time. There, fair goers have an opportunity to witness calves being born while veterinarians and animal husbandry professionals answer questions. As of Sunday, August 25, twelve calves have been born at the center. 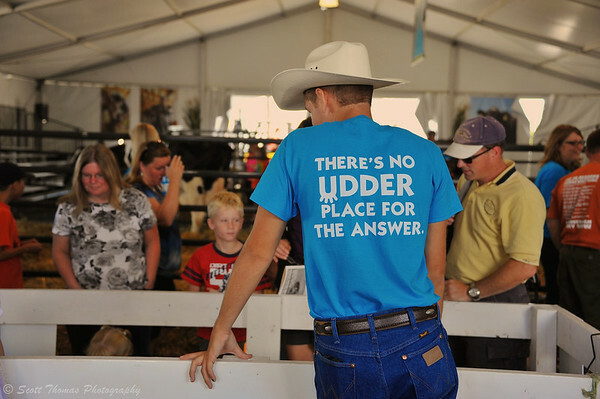 Volunteer answering questions at the new Dairy Cow Live Birthing Center at The Great New York State Fair in Syracuse, New York. Nikon D700/28-300VR, 1/125s, f/4.5, ISO 250, EV 0, 55mm focal length. Twice a day there is free entertainment at Chevrolet Court. 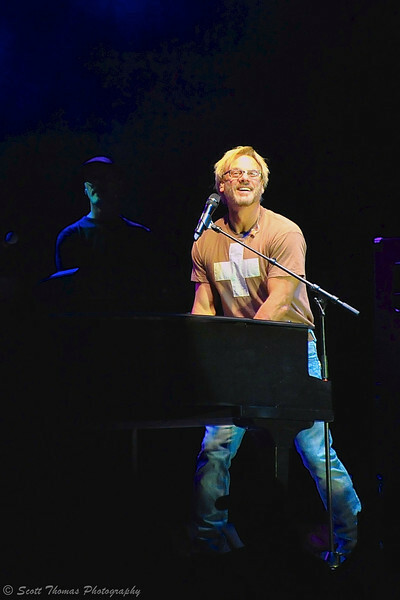 Last Saturday night, Phil Vassar, the piano man of country music, was on stage. Phil Vassar performing at Chevrolet Court during The Great New York State Fair in Syracuse, New York. Nikon D700/28-300VR, 1/320s, f/5.6, ISO 3600, EV 0, 300mm Focal Length. 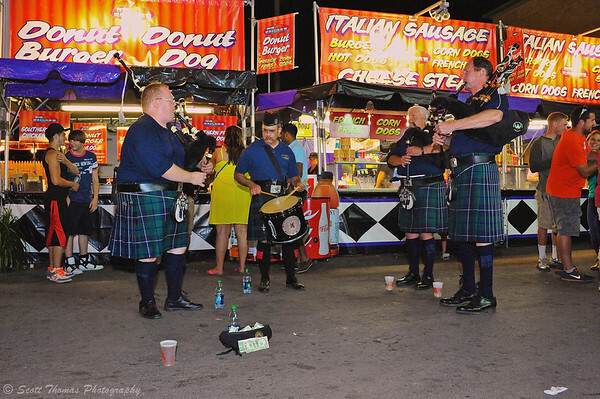 Irish bagpipers and drummer playing for tips in front of a food vendor at The Great New York State Fair in Syracuse, New York. Nikon D700/28-300VR, 1/60s, f/10, ISO 6400, EV 0, 28mm Focal Length, rear-sync flash. If you are a young exhibitor in the Dairy Cattle Barn, days can be very long. Wonder what the kids did before smartphones? 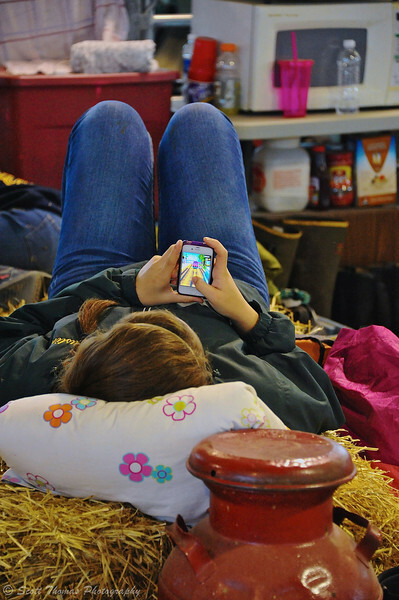 Girl in the Dairy Cattle Barn passing time by playing a video game on her smartphone at the Great New York State Fair in Syracuse, New York. Nikon D700/28-300VR, 1/125s, f/5.6, ISO 6400, EV 0, 125mm Focal Length. What do you like to do at your local or state fair? This entry was posted in People and tagged 28-300mm, bagpipers, band, bar, barn, birthing, can, center, country, dairy cattle, drummer, fisheye, flash, irish, men, milk, music, New York State Fair, nikon D700, phil vassar, piano, playing, rainbow, sb-700, sigma 15mm, singing, vr, women, young. Bookmark the permalink. Great shots looks like a great place to shoot and enjoy a relaxing evening, and you can’t beat that price on the milk !! No you can’t. The photography at the Fair is limitless. People make it so.